Perfectly-crisped roast potatoes, fluffy Yorkshire puddings, oodles of vibrant vegetables and lashings of gravy. Add some meat to the mix and you've got the perfect roast dinner, right? We beg to differ. Vegetarian and vegan roast dinners have much to bring to the party too. 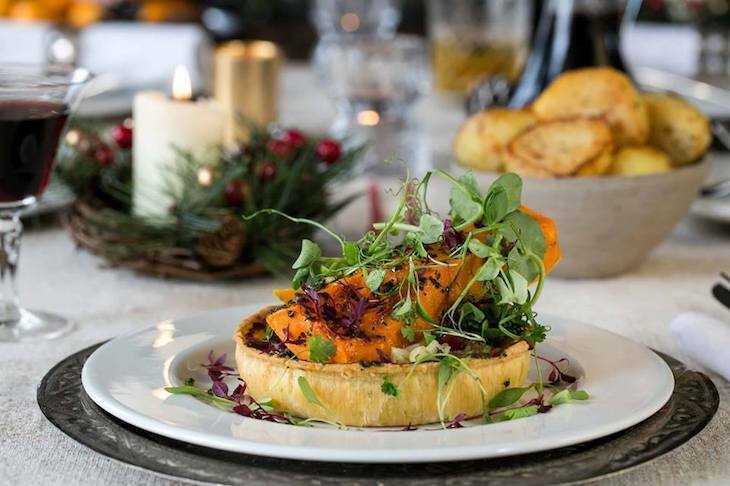 From supreme nut roasts to rich mushroom wellingtons, crispy tarts to meat substitutes good enough to fool even the most ardent of carnivores, there's plenty to keep the capital's meat-free munchers content of a Sunday. Here's where to get your vegan and veggie roast dinner fix in London. If it's the traditional, meaty roast you're after, you'll find the best roast dinners in London here. Serving 100% vegan cuisine, this south London cafe not only whips up fantastic vegan fare, but is also a not-for-profit social enterprise that works with local charities to provide employment and training opportunities. Doing good while you eat good sounds like win-win to us, and you can toast your success with a selection of homemade roast dinner favourites. Ever-changing specials mean on any given Sunday you may have the choice of nut roast, mushroom wellington or jerk-seasoned plantain (curve ball) reliably served with mash, veggies and some of the richest red onion gravy around. Finish with the sticky toffee pudding — it's a winner any day of the week. Claiming the title of London's first ever vegetarian and vegan pub, you can be assured of a hearty roast at Norman's Coach and Horses in the heart of Soho. If veggies are your bag, the vegan Sunday roast is a veritable mountain of freshly roasted fare. It's delicious, but the main menu contains even more goodies. 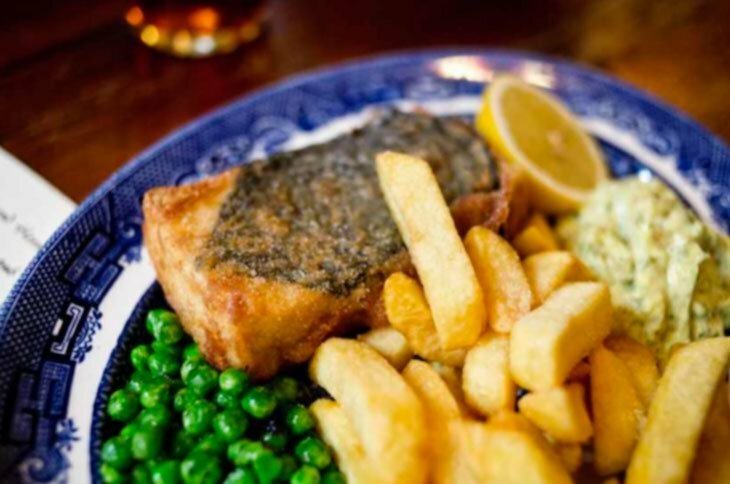 Their signature tofush and chips is all sorts of crispy, indulgent goodness, while pie specials range from spinach and chickpea to their take on a shepherd's pie. Not roasts, you say? Hey, they're baked in an oven and come with their own jug of hearty vegan gravy. That's good enough for us. Clocking in at over 50 years old, Manna might just be London's oldest vegetarian and vegan restaurant. That's a long time to perfect the ultimate vegan roast dinner, and by jove it's done it. The nut roast is a stunning example of the dish: moist, rich and packed full of spices. Oh, and it's absolutely ginormous. It runs out nearly every week, in which case the other Sunday specials beckon bright. These are an ever changing beast, but we still fondly remember the creamy butternut squash and flaky filo pie we devoured one Sunday afternoon. A mere ten minute stroll from East Croydon station, The Oval Tavern is a much-loved local boozer and all-round roast dinner winner. 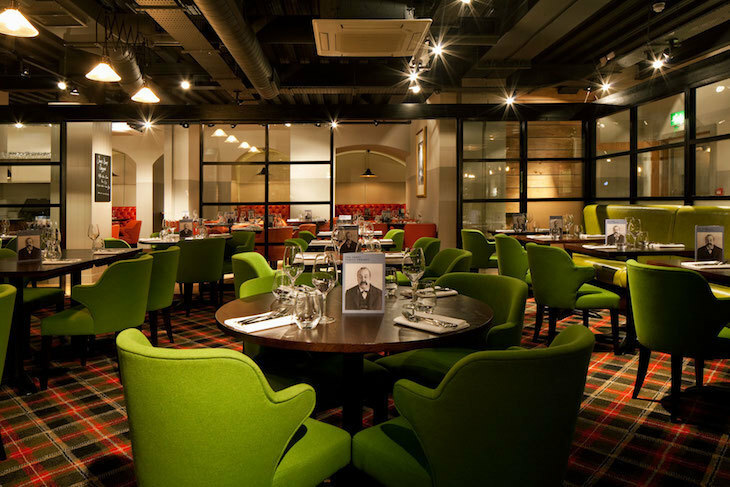 If you've got a mixed group of carnivores and vegans, this place will hit the spot with both vegan and veggie roast dinner options alongside their usual meat offerings. The Mediterranean nut, pepper and aubergine loaf is worth the journey alone for non-local residents, and that's before we've even got to the garlic-roasted potatoes, fluffy swede mash and the side of live jazz that's reliably served up of a weekend too. Cosy, family-friendly and with local brews on tap, Sundays just got even better. Tatty chesterfield sofas, wood-panelled walls and a warmly-lit bar welcome you upon entry to this Islington boozer. There's quirk here in spades and Saturday nights seem to be reserved for cocktails and dancing. But when Sunday afternoon finally rolls around, their mushroom wellington with vegetable gravy and olive oil-crisped potatoes is a very welcome sight indeed. Even non-vegans flock to north London's Karamel of a Sunday. This all-vegan cafe serves up the goods throughout the week, but their Sunday roast is legendary (without the dairy). It's a creative masterpiece with a smoky tofu, chestnut and almond wellington leading the pack, followed by a torrent of parsnips, mashed swede, peas, red cabbage, lashings of gravy and standout roast potatoes. It's enough to keep you full for hours and is best washed down with a vegan ale. What finer way to spend a Sunday? Lucky, lucky Deptford. Not only is The Birds Nest a cracking pub serving up decently priced pints, great live music and an unpretentious atmosphere beloved by locals. Not only is there a friendly resident cat (yes, a CAT! ), but their Sunday lunches also bring all sorts of roast-lovers to the yard. Alongside the meat options there's a classic nut roast, a mixed veggie roast and, for the vegans, two further options. Choose from a seitan-substituted meat roast with vegetables and gravy, or a meatless 'chickn' pie. It's fuss-free, hearty fare and at £9 it's one of the best value vegan roasts you'll find in London. Vegan nut roast is on the menu at this beautifully preserved, wood-panelled Victorian pub. It's got character in spades and is a marvellous spot to hunker down for a cosy afternoon, alternately dozing and snacking in front of an open fire. If nut roasts aren't floating your boat, the Sunday menu throws up a couple of added vegan treats too. White balsamic and tomato tarte tatin followed by miso-glazed aubergine? Don't mind if we do. An immensely popular local gastropub, don't forget to book a table in advance if you want to be assured of a space to sample The Talbot's Sunday roast dinners. The options are ever-changing, but recent choices include chickpea and sweet potato sausages, and tofu and almond loaf. Trimmings come as standard, but make sure you keep an eye out for their delectable apple and pear tarte tatin. It's 100% vegan, absolutely scrumptious and comes with almond pouring cream on top. Mismatched furniture, high ceilings, industrial lighting and quirky portraits covering every inch of the walls — The Bull and Gate is a feast for the eyes as well as the mouth. But all eyes will be on the vegan nut roast when it arrives, packed full of pumpkin, celeriac, candied beetroot and the ideal vessel for some added sage and leek stuffing. It's a mighty fine nut roast, but it's the presence of vegan Yorkshire puddings that gets them serious brownie points. Just make sure you ask for them especially, as they don't come as standard. The above pubs and restaurants are winners for scrumptious vegetarian roast dinners too. But if you're after some veggie inspiration without forgoing the dairy, here are some extra meat-free marvels just for you. Let's be honest, Borough Market is a pretty obvious destination for hungry Londoners. But, did you know there's an entire restaurant dedicated to roasted food? Ok, the name's a bit of a giveaway, but it's important to cut to the chase when there's roasties on offer every day of the week. The veggie offerings here are bright and refined rather than hearty, with roasted beetroot burger leading the pack in terms of flavour and style. Don't go expecting rustic decor and roaring fires either as it's a pretty classy affair, all linen tablecloths and floor-to-ceiling windows. The price matches the upmarket surrounds but, hey, it is Borough Market. A suitably trendy name for a trendy restaurant in a trendy part of London, this Shoreditch steakhouse may look a little exclusive from the outside but don't let that put you off. Good times and great food are at its heart, and that extends to the vegetarian nut roast on a Sunday which comes with, wait for it... cheese sauce. And Yorkshire puddings. And mashed potato. There are some vegetables in there too, but did we mention the cheese sauce?? 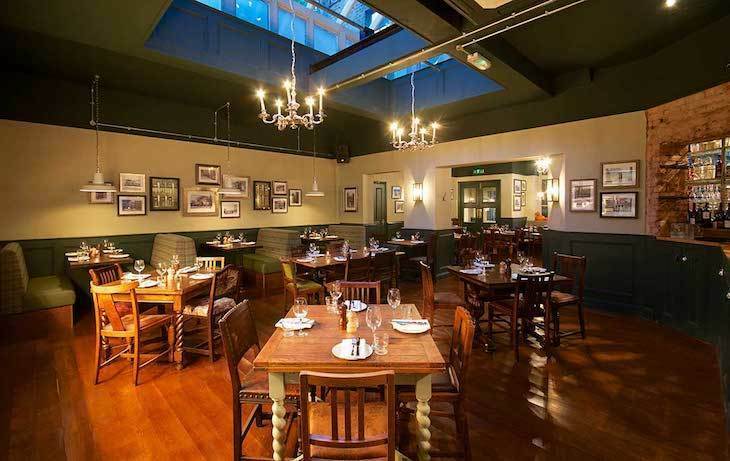 Following an extensive refurbishment in 2013 from its 19th century music hall roots, The Wilmington has transformed into a charming public house, packed full of historical features and boasting a large glass atrium over the dining room. It's a beautiful spot and a welcome excuse to stuff your face with their vegetarian offering of a Sunday lunchtime: wild mushroom and goat's cheese wellington. Prices are fair considering we're a stone's throw from Farringdon and King's Cross, portions are generous, and the welcoming atmosphere is just the cherry on the cake. 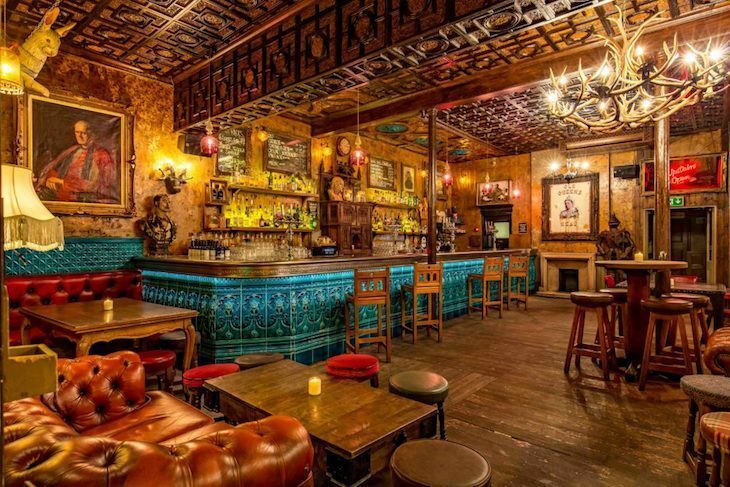 South of the river, there are no pretentious airs and graces at this Brixton pub. Just a great beer selection, chilled vibes and not one, but two vegetarian roast dinners on offer. The choices may not be surprising — veggie wellington or traditional nut roast — but what is impressive is that this makes up exactly half of their roast dinner offerings. That's right, half of the Sunday roast menu is vegetarian, and both dishes can be made vegan upon request too. Hats off, Crown and Anchor. Any London pub with 'butchers' in the title probably doesn't fill vegan or vegetarian diners with much hope when it come to roast dinner options. But let us stop you there, for the jolliness to be found at this butchers isn't just for the carnivores. The crumbed goat's cheese studded with nuts and cranberries gets top marks from vegetarians, while the vegan nut roast comes with all the trimmings you could hope for and is also gluten free. Little vegans can enjoy their very own kid-sized nut roast too. And if you're looking for an excuse to hang around, the gargantuan range of real ales, craft beers, stouts and lagers should do the trick. After a day's deer-spotting in Richmond Park, a friendly pub with a cracking beer garden can sound like a mighty appealing option. Make that day a Sunday and The Marlborough will throw up another treat: the roast dinners (and some of the most ginormous Yorkshire puds you've ever seen). There's a vegan nut roast, but it's the root vegetable pie that really gets your tastebuds singing. It's packed full of fresh veggies, beautifully cooked and, big bonus, comes with extra gravy on the side. Your pooch can even join in the fun as The Marlborough is dog-friendly too. An old-timer on London's veggie scene, The Gate is somewhat of an institution. Londonist's Joanne Gould says that the restaurant mini-chain "describes itself as Indo-Iraqi Jewish food with French and Italian influences... We describe it as yum". It's a fair assessment. The first venue in Hammersmith is fast approaching its 30th birthday and newer venues in Islington and Marylebone have proved just as popular. The three-course Sunday roast menu (currently only available at the Hammersmith and Islington venues) is a cornucopia of veggie delights. Crispy marinated tofu or artichoke terrine to start? Bulgur and beetroot burger or wild mushroom roasted stuffed onion for main? Peanut butter brownie or poached peaches for dessert? These are the sorts of decisions you'll be faced with, and what a welcome quandary to be in. Know any other roasts that deserve a mention. Comments below.